Marks and Spencer has said it is mystified by a claim by MEP Robert Kilroy-Silk that it uses “distorting” mirrors in its changing rooms. Mr Kilroy-Silk has accused the store of misleading women with mirrors that make them look slimmer in its clothes. 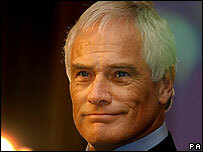 By an amazing coincidence, I’ve noticed that every photograph of Robert Kilroy-Silk seems to have been taken with an orange filter over the lense.